A firm favourite with Harry Potter fans, Alnwick Castle is set to create further magic with The Duke and Duchess of Northumberland’s Attic Sale later this month. Taking place in the Guest Hall from noon on Saturday 27th October, visitors will have the rare opportunity to bid for items from Alnwick Castle, Syon House (the Duke’s official London residence), Stanwick Hall, Albury Park and other Ducal properties. By special invitation there will also be items from Blagdon Hall, on the direction of Viscount Ridley. Alnwick Castle has been owned by the Percy family for over 700 years and remains their family home to this day. It is the second largest inhabited castle in England after Windsor and has been used as the set for many films and TV series including Transformers, The Virgin Queen and Downton Abbey. In addition to everyday household objects such as lampshades, paintings, curtains, chairs and bookcases, a number of more unusual lots will go under the hammer. 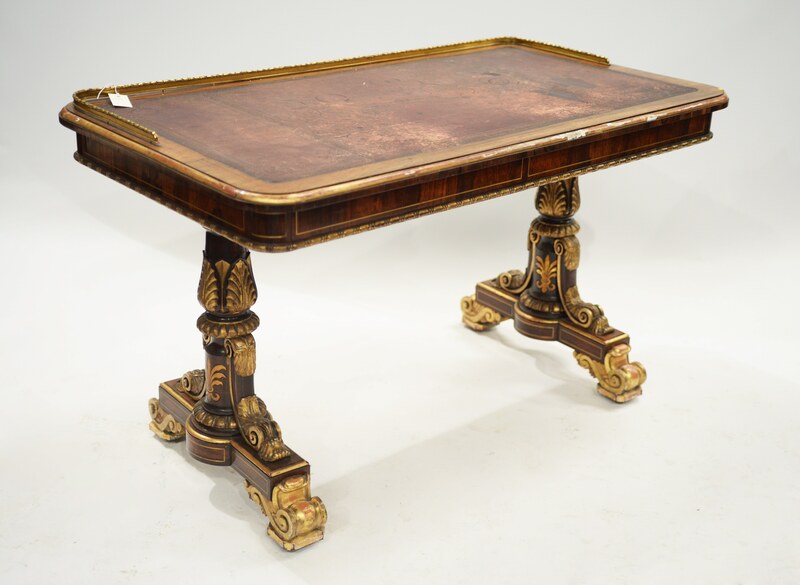 These include a Regency rosewood and parcel gilt writing table, which was formerly in the Duchess’s sitting room at Alnwick Castle and is valued at £3,000-£4,000. A George IV rosewood and oak breakfront folio cabinet by the important early 19th century cabinet maker Robert Hughes, which was supplied for the former music room at Syon House in 1827, is anticipated to sell for anything up to £10,000. A charming white ancient marble relief, circa 1850, which features Cupid and Psyche, is expected to attract international interest having clearly been executed by a talented sculptor in one of Rome’s workshops. This could make up to £12,000 during the auction. Clare Baxter, Collections and Archives manager at Northumberland Estates, said: “Over the years there have been many changes to the household and to the usage of numerous rooms across various properties. Inevitably many items have ended up in store and the Duke and Duchess felt that it was time to have a good sort out, clearing space so as to improve the storage of everything that they do want to keep. Julian Thomson, Managing Director at Anderson and Garland, added: “This is a fantastic opportunity to see and purchase a wide variety of household goods from Northumberland Estates within what is one of Northumberland’s finest places to visit, Alnwick Castle. “As well as the more day to day items we have some big-ticket pieces that we expect to draw national and international attention because of their provenance. Viewings open at the Guest Hall and at Unit 13, Lionheart Enterprise Park North in Alnwick, from 10am – 5pm on Thursday 25th and Friday 26th October and on the morning of the sale from 10am - 12pm. Those wishing to attend the auction will be able to access the Guest Hall without having to purchase a ticket to the Castle. Full information, including the catalogue, is available at www.andersonandgarland.com. For further details, images, viewings or interviews please contact Sarah Hall - sarah@sarahhallconsulting.co.uk / 07702 162704. This press release was distributed by ResponseSource Press Release Wire on behalf of Sarah Hall Consulting in the following categories: Entertainment & Arts, Home & Garden, Women's Interest & Beauty, for more information visit https://pressreleasewire.responsesource.com/about.